The bravery is endlessly invoked, the “fanatical courage” hymned with an almost religious fervour. Anna Politkovskaya, nearly four years after her murder, is not forgotten. She is one reporter whose words will long be “held in awe”, as Helena Kennedy says in her introduction. She is the voice of conscience faced with brutal inhumanity and the peril that goes with it. But this superb collection of the pieces she wrote for Novaya gazeta adds another dimension. It measures her as a journalist against other journalists round the world. It reveals a superb original technician. How do you best write a print story these days? American academics, as usual, debate technique as though it were holy writ. Who, what, when, and where all in the first paragraph, a trail of relevance slowly diminishing towards a tedious close: that’s the way our newspaper forefathers who worked in lead type deemed best. Just give us the facts up top. And make sure we can cut lumps of type from the end if we need to. But does this matter in an era of digital setting where anything comes and goes at the press of a button? Following are more photos taken by Russian bloggers on the scene at the observation of the third anniversary of the murder of Anna Politkovskaya in Moscow. 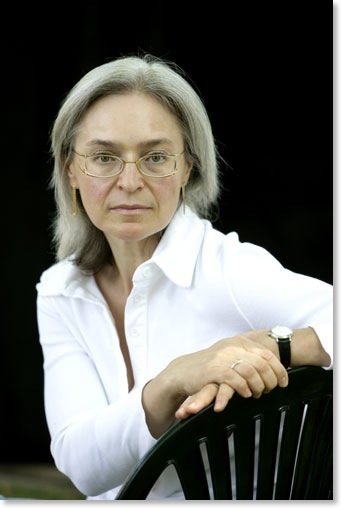 Last week was the third anniversary of the assassination of hero reporter Anna Politkovskaya. 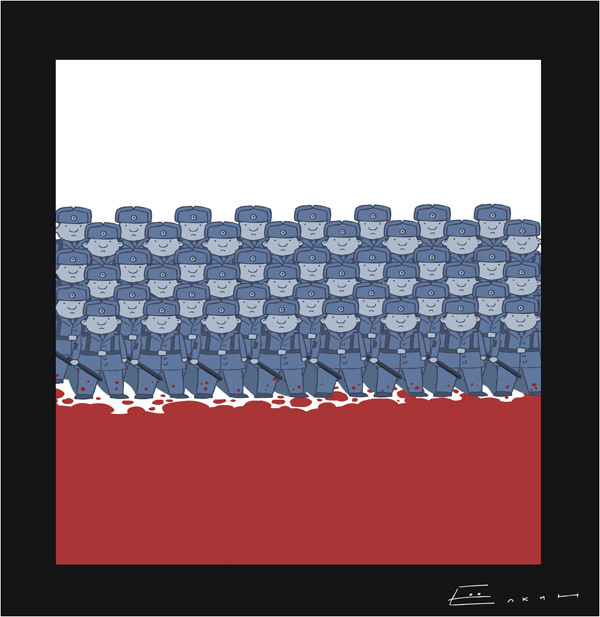 The Kremlin commemorated the event in its usual bloodthirsty fashion. First, it handed victory to the crazed mass-murdering dictator of Chechnya, Ramzan Kadyrov, in his libel suit against the Memorial human rights organization over Memorial’s demands for justice in the killing of Politkovskaya’s successor, Natalia Estemirova. Politkovskaya worked closely with Memorial in reporting on human rights issues in Chechnya, and Kadyrov hated them equally. Then, it booted Reporters without Borders out of the country. Last year it was Human rights Watch, this year RWB. RWB has been tireless in standing up for justice in the Politkovskaya murder case, which has gotten exactly nowhere in the three years since her brutal, barbaric killing. And for the capper, it toasted Vladimir Putins’ 57th birthday. Three years ago today Anna Politkovskaya, a courageous journalist who exposed appalling human rights offenses in Chechnya, was shot five times as she entered her Moscow apartment building. She was not the first Russian journalist to be slain for performing the invaluable function of bringing buried truths to light. Sadly, there have been, and will be, more murders. And we all pay the price. Westerners were inclined to think during the Cold War that a democratic Russia would be better for Russians and for us. Yet 20 years after the fall of the Iron Curtain, hopes for genuine democracy in Russia remain unrealized. A major reason is the parlous condition of the Russian media. The failure of a Moscow District military court jury last month to convict those charged with involvement in the murder of journalist Anna Politkovskaya may have had less to do with the skill of defense attorneys than with materials the government offered that appear designed to discredit her, according to a Moscow commentator. It can’t have surprised anyone vaguely familiar with Russian politics these days to learn, from Kremlin bagman Alexei Pankin in the pages of the Moscow Times, that the Putin regime plans to use the Politkovskaya trial acquittal to lay the Russian jury system in its grave.